A group of suburban men form a Neighbourhood Watch group to solve a murder, but find themselves battling an alien invasion. Honestly, if you have seen any of the recent films made by the four leads – with the exception of Richard Ayoade – you will have a pretty good idea of what to expect from The Watch. As always, Stiller’s character Evan is an uptight do-gooder who freaks out loudly and often, Vince Vaughn as Bob is inappropriate and unfocused and Jonah Hill plays a fairly small character who is always trying to be the big man in front of his older friends. Sound familiar? Thought so. Thankfully, The Watch is a lot better than Jonah Hill’s recent outing in The Sitter, marginally better than Couple’s Retreat but falls short of the ‘lofty’ (I use the term loosely) heights reached by Tower Heist. None of the actors stretch themselves in the slightest; it is amusing to see Richard Ayoade play a foul mouthed, promiscuous character, but it is a little sad to see him move from genius work on TV and behind the camera – his work on Community was fantastic – into a mediocre disappointment of a film. When watching films by actors who seem to always play to type, it is hard not to wonder what would happen if the characters were switched around, surely it would be more entertaining to see Stiller play a drunken, loudmouth father than the tightly wound character he has been playing for years? But I digress. 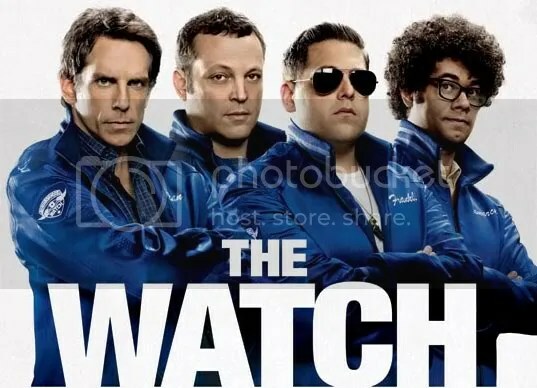 The Watch has seen many incarnations over the years; it started off as a children’s comedy until Seth Rogen got involved and brought it up to an R-rated, adult comedy. Sadly, whatever charm these awkward characters may have once had was lost in rewrites; the jokes are uninspired and the story farcical. Director Akiva Schaffer is arguably best known for his work in The Lonely Island, and directed cult classic Hot Rod. It seems that he was uninspired by The Watch however, as most of the film is predictable. As well as this, the story is stupendously silly, and while there are a couple of laughs in there, The Watch is not the comedy that it should be. In all, The Watch brings together former (and future) powerhouses of comedy who seem to be stuck in a rut of playing the same characters over and over again. Richard Ayoade is criminally underused and most of the film is just not that funny. The film’s development problems are there on the screen to see, and while there are some good moments, it is possible that The Watch should have gone through another rewrite before it was brought to life on screen.